AFTER THE MASS shooting in Parkland, Florida, in February, the top trending video on YouTube wasn’t a news clip about the tragedy, but a conspiracy theory video suggesting survivor David Hogg was an actor. The video garnered 200,000 views before YouTube removed it from its platform. Until now, the company hasn’t said much about how it plans to handle the spread of that sort of misinformation moving forward. On Tuesday, however, YouTube CEO Susan Wojcicki detailed a potential solution. 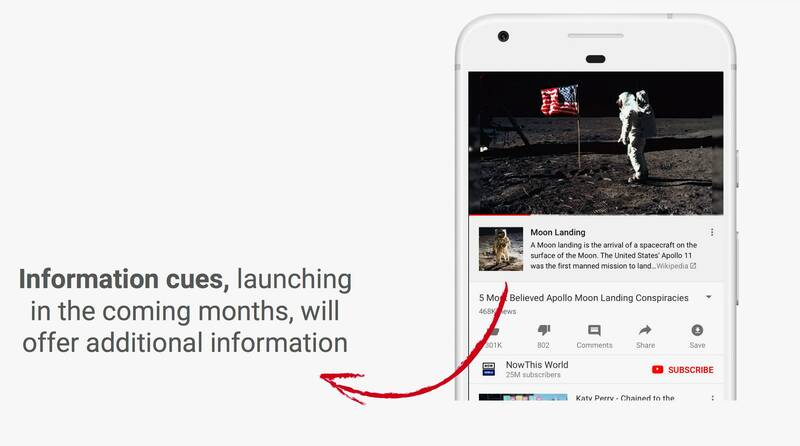 YouTube will now begin displaying links to fact-based content alongside conspiracy theory videos.Wojcicki announced the new feature, which she called “information cues,” during a talk with WIRED editor-in-chief Nicholas Thompson at the South by Southwest conference in Austin, Texas. Here’s how it will work: If you search and click on a conspiracy theory video about, say, chemtrails, YouTube will now link to a Wikipedia page that debunks the hoax alongside the video. A video calling into question whether humans have ever landed on the moon might be accompanied by the official Wikipedia page about the Apollo Moon landing in 1969. Wojcicki says the feature will only include conspiracy theories right now that have “significant debate” on the platform. The problem with the recommendation algorithm is that it feeds users ever-more extreme content, sometimes straying from what they searched for in the first place. For example, if you search for a video about the Holocaust, YouTube might recommend that you then watch one about how the tragedy was a hoax. The recommendation system isn’t designed to ensure you’re informed; its main objective is to keep you consuming YouTube videos for as long as possible. What that entails has mostly been an afterthought. Even if every conspiracy video is served up with a Wikipedia article contradicting the information that it presents, there’s no guarantee that users will choose to read it over the video they’ve already clicked on. Take, for example, what happens when you search conspiracy theorist Alex Jones’ videos about the Parkland shooting. After watching one, YouTube recommends you then watch another of Jones’ videos, this time about how the Sandy Hook shooting was a hoax. It doesn’t suggest that you watch a factual clip about Parkland or Sandy Hook at all. YouTube’s algorithm system serves to radicalize users, and until that’s fixed, the company will likely continue to suffer from scandals related to misinformation. Merely serving up factual information has also not been a cure-all for other platforms that have suffered from scandals associated with misinformation, like YouTube’s parent company Alphabet and Facebook. Both Google News and Facebook’s trending bar have surfaced conspiracy theories during breaking news events in the past, despite having plenty of links to more reputable news sites on their platforms. It’s remarkable, too, that an enormous platform, equipped with a flow of advertising cash, has chosen to address its misinformation problem primarily using the work of a donation-funded volunteer encyclopedia. Another obvious question here is whether Wikipedia and YouTube will be able to keep up with with breaking news events that quickly fall prey to conspiracy theories. For example, the Parkland shooting survivors were accused of being actors within hours of the tragedy. It’s unclear how quickly YouTube will be able to add links to the thousands of misinformation videos that are uploaded every time a major news event occurs. Today, the team at iNPUT-ACE is proud to announce the release of iNPUT-ACE Version 2.0, our largest release yet. The new version comes packed with an abundance of significant new features, comprehensive improvements and upgrades, new licensing options, and more. Read on to learn more about some of the notable new features in the latest version of iNPUT-ACE! We revamped the old Narrative Report tool in iNPUT-ACE from the ground up—and our new design provides the most exciting new feature we have ever added to iNPUT-ACE. The new Narrative Report is a dynamic, intuitive, and powerful word processor that allows investigators to write comprehensive reports with embedded video and image content. The screenshot below highlights one of the many ways the Narrative Report tool can be used to expedite your video evidence casework, and help get your evidence into the court room. By simply dragging in video and image evidence into the iNPUT-ACE Narrative Report, users can quickly build dynamic PDF reports that help get complicated visual evidence to the courtroom. The resulting PDF can be shared with prosecutors, investigators, video analysts, or anyone else who has a standard PDF reader. The standard full version of iNPUT-ACE comes packed with features to expedite the review, analysis, enhancement, and processing of digital video evidence. But some users simply want to play and convert proprietary DVR files, without all the other bells and whistles. With this latest update, at significantly reduced cost, the brand new iNPUT-ACE | Lite version is here to meet those needs. We know budgets are often tight. Licenses of iNPUT-ACE | Lite are a significantly reduced cost from the full version, and bulk license discounts are available so that agencies can outfit their entire investigation units with this powerful software without breaking the bank. One of the most commonly requested features from iNPUT-ACE users was the ability to move licenses from one machine to another with ease. We heard your feedback: now you can. If you’ve ever wanted to take the software with you on a laptop while visiting a crime scene, and then seamlessly move your iNPUT-ACE project to another workstation, the new iNPUT-ACE Dongle license is here to help. The USB Dongle license allows you to use iNPUT-ACE on any computer by simply plugging in the USB device. With the release of 2.0, iNPUT-ACE is now more powerful than ever, and continues to raise the bar with world-class tools for the examination, processing, and presentation of video in criminal investigations. And we couldn’t have done it without our dedicated users, who work tirelessly in the field and provide us with feedback and insights that help make iNPUT-ACE better. In addition to the enhanced features and new licensing options described here, the new version also comes with a significant number of fixes, improvements, and other exciting new features. Stay subscribed to our newsletter to receive the full release notes. If you have any questions about the new Narrative Report tool, iNPUT-ACE | Lite, Dongle licensing, or anything else about iNPUT-ACE 2.0, don’t hesitate to contact us. Published on February 8, 2018 by Kelly Watt. In addition, the kit includes some special adapters supporting custom form factor and special interfaces SSD. The kit also includes mSATA, Micro SATA, and Slim SATA adapters. Supplied with the kit is a list of the known SSD sorted by MFG part # which direct the user to the right adapter. Our mission is to provide accurate peer reviewed analysis of complex scenes in support of criminal or other legal actions. We provide outstanding instruction in bloodstain pattern analysis, crime scene processing, shooting incident reconstruction, officer involved shootings and computer animation. With over 30 years of experience, we are the nation’s most proficient developer and manufacturer of forensic kits. IFI TEST – RSID DISTRIBUTORS IN S.A.
Based upon chemiluminescence, its unique formula qualifies it as the most effective blood revealeravailable on the market, for crime scene as well as forensic lab use. We help our #policepartners and #publicsafetypartners around the world to Command Every Scene™ they encounter. We deliver confidence through solutions that equip our customers to execute their missions backed with knowledge delivered through our Education and Training program. Departments and organizations use Sirchie Vehicles to arrive at their scenes ready to handle their call of duty. All delivered with our exceptional customer service.